Dollar sign measures approx. 2" x 2"
Want to add some shine to your swagger and hep to your step? 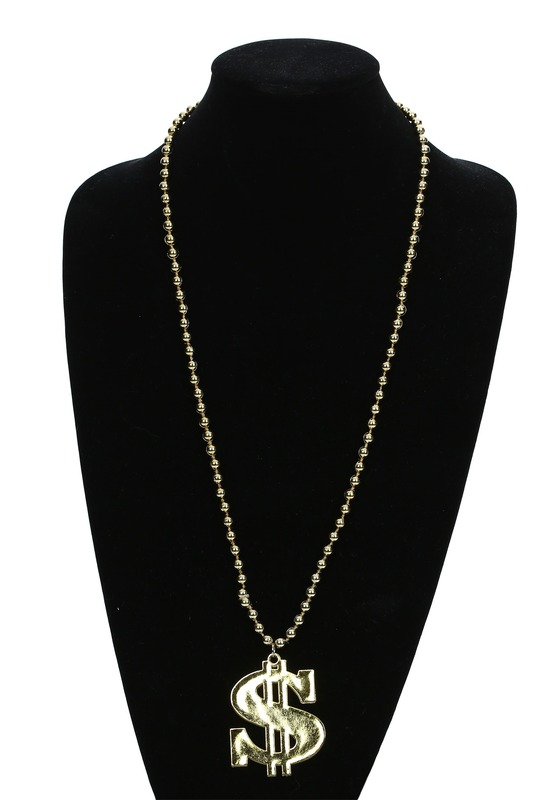 We already know you’re one cool cat because you’re checking out this deluxe dollar sign necklace. If over-the-top is what you seek, then look no further. Show your affinity for “dead presidents,” and especially Ben Franklin, the inventor and historical figure who’s prominently featured on your favorite high-buck bill. Deck yourself out like you’ve got mad stacks of cash just waiting to be spent. This is the quintessential accessory to bring back that old school vibe. Nothing says status quite like the stack of cash you’d have to give up for the real deal. Strut into any party with the flash of Fort Knox without the sticker shock. Instead, you can keep your hard-earned cash and look the part.